Lebkuchen for sale. Buy online at Zingerman's Mail Order. Gourmet Gifts. Food Gifts. A spicy sweet German tradition. 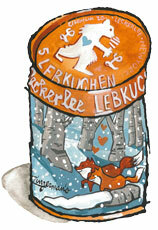 Sandy Lee fell in love with lebkuchen, the traditional German Christmas cookie, while living in Berlin. “It was like nothing I’d ever tasted,” she recalls. “I couldn’t get all those complex flavors out of my head.” She became obsessed, learning all she could about them before returning to the states and starting her own lebkuchen bakery. The recipe dates back to Medieval times and has many steps. The dough is made from almond and hazelnut flours, whole almonds, egg whites, honey, marzipan and a bevy of spices. The dense dough rests for nearly a day before heading to the oven. The finished cookies are hand glazed and studded with almonds (classic variety) or cloaked in dark chocolate. You will find three classic and two chocolate cookies in this wintry-themed tin, designed by Zingerman's own super talented in-house illustrator Ryan Stiner, featuring foxes walking through the snow in front of Zingerman's Deli. Each is about four inches across and an inch tall. They’re thick, moist, slightly spicy, sweet and very nutty. The consistency is a cross between cake and marzipan, making them the perfect after dinner treat with coffee or tea. Although traditionally intended to keep for months, I think these sweet, spicy, nutty treats will only last a few days (or hours!) at your house. A cookie with history, a perfect gift for anyone on your list. "These tins are gorgeous! Breath taking... The cookies are amazing of course but the tin is just delightful. Perfect for special kids Halloween bags, Thanksgiving, and well just every day... I was going to hold onto mine for Christmas presents, but then, the Rockies played baseball last night and won and I ate cookies."